FILL YOUR BATHROOM WITH AN EVERLASTING, FRESH AROMA! SIMPLY - ProudMummy.com the Web's Community for Mums. FILL YOUR BATHROOM WITH AN EVERLASTING, FRESH AROMA! SIMPLY PLACE A FEW DROPS OF ESSENTIAL OIL (LIKE LEMONGRASS SCENT) ONTO THE CARDBOARD TUBE OF YOUR TOILET PAPER ROLL... 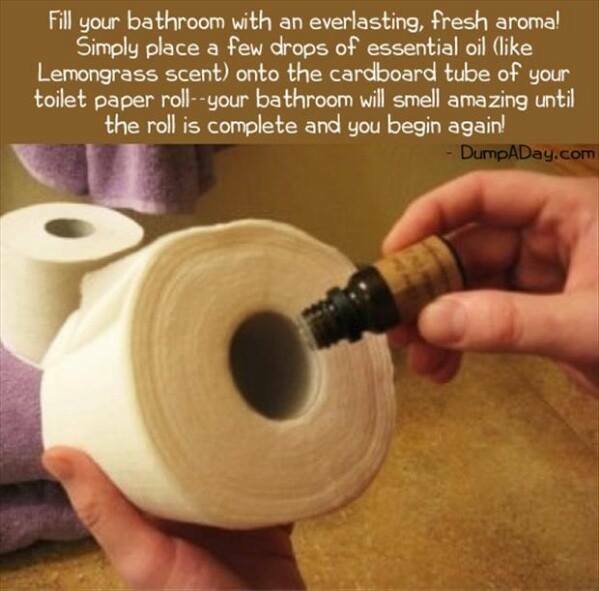 YOUR BATHROOM WILL SMELL AMAZING UNTIL THE ROLL IS COMPLETE AND YOU BEGIN AGAIN!